Nathan’s parents were in town most of last week. They leave later today. So I have been M.I.A. from any channel of social networking, including emails. Beside the point. Since they were here, we were all off routines and schedules. We went out shopping often, worked in the yard, visited family, so on and so forth. Getting back to date night, we had it on Thursday night. Lesson #1: Date night with the in-laws… laughed until we cried. I love Nathan’s parents. We get along so well. Always have a blast when they are here. They are game people like us. So we played a new game called Killer Bunnies Remix . A friend my mine, (Hi, Court!) had told us about Killer Bunnies . Then I found it on clearance for $6. Deal! Date night last weekend was our first time playing. It took a while going through the instructions and figuring out the game. But by the end of the game, we were hysterical. We also munched on a pistachio cake my mother-in-law made. Lesson #2: We got to see a whole new side of my father-in-law. Nathan said: This was a fun game. My dad, however, cheated and knew the answer and then traded accordingly at the end for the win. This is a great game for exposing liars and cheaters. 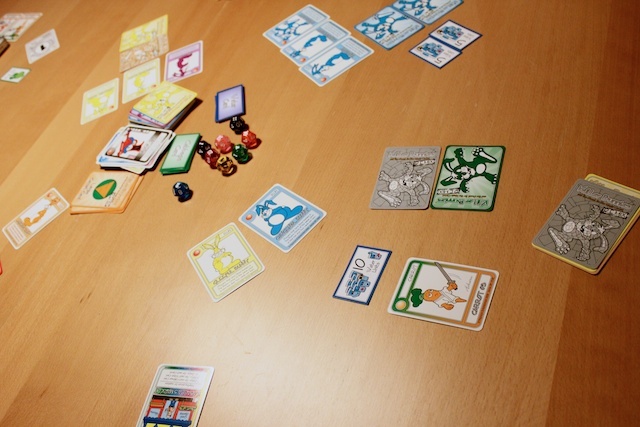 » Tell me… What is your favorite game as in board games and such? Want to join Project 52: Date Night? Awesome! Start anytime. Go here for details about the project and print the pledge. Keep it clean and family friendly. This is a family friendly site. Anything inappropriate will be deleted. It needs to be a date. Not your latest projects or pictures of your beautiful children. I do love reading about your projects and learning about your family. But this linky is for date nights and date nights only. It is for us to exchange date night ideas. Link to a specific blog post about your date that week. Don’t just link to your site’s home page. It needs to be the direct link to the post. Anything not directly linked to the post will be deleted. Link back to Simply Modern Mom or put the Project 52: Date Nights button on your site. It’s common courtesy. Please be nice. Family game nights are so much fun! I’ve seen “Killer Bunnies” before but hadn’t actually heard anything about it. I might have to pick it up! I’m going to check that game out. Sounds like fun. I LOVE to play games…any kind–board, card, video, outside, etc. I don’t think I could choose a favorite. Some that I love would be Catch Phrase, Balderdash, Compatibility, and so many more. I have never hear of Killer bunnies though so I might have to check it out. Always on the lookout for fun games – will add to my amazon wish list! I have never heard of Killer Bunnies but it looks fun. I’ll have to keep my eye out for it. I <3 Cranium! again we slacked… i’m so ashamed 😉 my husband hurting his ankle has really taken us out of the loop. i’ve been way too exhausted. we have had a few movie nights and last night we did play cards together so that counts!